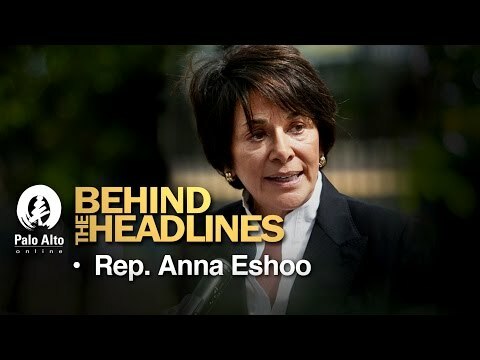 On this week's "Behind the Headlines," Rep. Anna Eshoo joins Palo Alto Weekly Publisher Bill Johnson, Editor Jocelyn Dong and Staff Writer Sue Dremann to discuss airplane noise (starts at 3:38), Caltrain electrification (13:32), H-1B visas (19:38), undocumented immigrants (21:57), civil unrest (27:28), political climate in Washington (33:56), Russia's election interference (43:16) and Eshoo's future (50:40). Just watched the Anna Eshoo video. Nice to see Bill Johnson push back a bit when Eshoo claims that the San Carlos Airport noise issue is on hold because the FAA has been "hollowed"out by the new administration. There have been NO staff cutbacks at the FAA in the past 6 months and she was clearly flustered when Bill stated that the head of the FAA remained on the job. Eshoo is one of the most ineffective members of Congress and this video shows why. Eshoo was referring to the FAA response to the Select Committee of South Bay Arrivals. While the smaller airports are a nuisance, the noise issue here are 300+ giant LOW flying jets from SFO. San Franciso - the airport that we chose not to live close to. Michael Huerta, the current head of the FAA was appointed by President Obama, and has been running the FAA since 2011. Before heading the FAA Huerta was the executive director of the Port of San Francisco, the Port Commissioner for New York City, and was a senior secretary in the USDOT in the Clinton Administration. I think it is safe to say Huerta is a Democrat. After the presidential election Huerta vowed to finish his eight year term at the FAA despite the change to a Republican administration. SFO generates hundreds of millions from landing fees and concessions that flow into the City's general fund every year, and is the primary transportation system supplying San Francisco's tourist based economy with its raw material. Powerful San Francisco Democrats are much more concerned with keeping San Francisco owned SFO going and growing, than solving the noise problem on the Peninsula. When Nancy Pelosi and Chuck Schumer speak, Michael Huerta listens. Anna Eshoo and Jackie Speier... not so much. I watched the video, and Representative Eshoo was focused on blaming Trump for the lack of FAA response. Bill Johnson challenged her assertion, saying the FAA staff that is involved in our concerns is still at the FAA, and she avoided answering by changing the subject. I think it rather unfortunate that Eshoo is focused on partisan politics, instead of trying to solve our problems. I went to Eshoo's web-site and she is listed with Armenian and American background. I was surprised as I have family members who are Armenian and I have been to Armenia. What is relevant here is that a large Armenian community resides in California (Fresno, Glendale, Burbank) and the original settlers came through the organized immigration locations on the east coast like Ellis Island. Immigration occurred during WWI with the breakup of the Ottoman Empire and later with the dissolution of the Soviet empire. Bottom line is that people's backgrounds and cultural/family history form the pool of opinion and background emotions on many topics that we are now addressing. Likewise Trumps father came from Alsace Lorraine which was being bounced from France to Germany through a number of wars - a major group coming as a result of the Franco-Prussian War in the 1870's. Many of those arrived in California, including Eugene Meyer and the Meyer family of the Washington Post fame. That is a large family who have done well for Stanford and San Francisco. To say that he is uneducated on that topic is very wrong - suspect that he has a lot of feelings concerning how many small states get bounced around as a result of wars. His father got bounced around and he knows. Given the background of all of the congressional members I have to wonder why they attack each other. It is not acceptable for the position they are in to bad mouth each other. That is unfortunate and is not selling more applicants for any one party. Can't sell on a negative approach. Anna Eshoo represents the 18th Congressional District. The Congressional Districts are not consistent with the county lines. The city of San Jose is not in the 18th district. It is one of the biggest cities in the state and controls the county tax planning and legislation for the county. It also has the job of increasing the use of the San Jose Airport for International travel which overlaps the SFO and Oakland flight paths resulting in lower altitude flights. Meanwhile San Mateo going north is in a different district. San Mateo County is running a different tax base and set of priorities. It looks like the 18th district is stuck in the middles resulting in less leverage to get things done. It is noted that the district from 2003 - 2013 included many San Joaquin cities so changing the congressional district lines looks like it is doable. We are losing on the airline problem here and not sure how it can be fixed with us in the middle. We have no control over the purse strings for the airports. Checking out Adam Schiff - [Congressman] in LA area which includes Burbank, Hollywood, Little Armenia. He has worked with Dianne Feinstein on a Helicopter Relief Bill for Los Angeles - so people are accomplishing something to reduce noise - just not here. Agree with you...losing here in the middle because San Jose and San Francisco care more about their purse strings than their neighbors. Alota congressional talk about science and environmental justice while pushing airport waste and pollution, to Palo Alto. Does the FAA even need Pelosi or Feinstein to call shots? SFO and SJC must say jump, and the FAA says how high. The interview could have been more interesting if Eshoo was asked about that. That's more likely a reason for problems than Trump. In SoCal...Culver City and others are suing the FAA about LAX jets, probably another can of worms. I want to thank Bill Johnson for pushing back on Anna Eshoo's comments about the FAA, and their reason for delaying the "draft" of SERFR, Oceanic and Pt. Reyes routes (possible changes). It is laughable that Anna said she called the FAA yesterday to get information. Also, trying to lay the blame on Trump was a typical lame response. Thank goodness Bill was able to push back and hold her feet to the fire. As a polished politician, who knows how to avoid unpleasant questions, and pretend that she has done something to alleviate our ruined quality of life here in Palo Alto, Los Altos, Mt. View. She has not held one Community Meeting here in Palo Alto. Her Select Committee Reps for Santa Clara County were from Saratoga, Los Altos Hills, East Palo Alto. The alternative was from Palo Alto! She used the whole Select Committee process as cover for her lack of effectiveness to get things done. Bringing in Jackie Spier (San Mateo County/Congresswoman) was another way to not deal with the complete rerouting of all arrivals South from San Mateo County to Palo Alto/Los Altos area. We need a Congressperson to STAND UP for us and get things done! I know that the Santa Monica Airport - a smaller municipal airport but caters to the rich jet crowd is getting shut down. It will be a gradual process but is happening because of the noise. Historical note - used to be McDonnell Douglas which moved on to Huntington Beach and was bought by Boeing. Great history for planes and our space programs. Another example of manufacturing that supported all type people is gradually being forced out of state due to high California taxes. The taxes are killing the diversity of jobs which keeps all skill and educational levels employed. The state cannot keep reducing the variety of jobs. Even Hollywood is sinking and the production process is being funded by China. Our minimum wage is higher than the national level and is creating a challenge for the restaurant business.